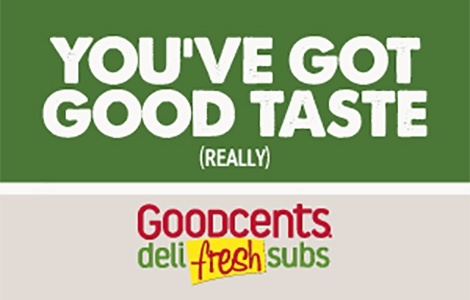 Goodcents® Deli Fresh Subs is the Official Home of Soft Breads Baked Daily and Freshly-Sliced Meats! We are all about high-quality, made-to-order submarine sandwiches. Hungry for hot soups, pastas, or cookies? We do those too! You'll also find either dine-in or take-out, plus on-line ordering and delivery for ultimate convenience. With more than 80 locations in eight states across the country, Goodcents Plastic and e-Gift Cards are the perfect surprise for someone that craves SUBstantially better food! Useable up to balance only to purchase goods or services at participating Goodcents Deli Fresh Subs Restaurants or through GoodcentsSubs.com. Present this card to cashier at time of purchase and card’s available balance will be applied toward your purchase. Not useable where prohibited by law. Card is not redeemable for cash unless required by law. Card will not be replaced or replenished if lost, stolen damaged or used without authorization. Goodcents Corporate Franchisor or the independently owned Franchisee where card was purchased is the card issuer and sole obligor to card owner. Goodcents Franchisor or Franchisee may delegate its issuer obligations to an assignee, without recourse. Purchase, use or acceptance of card constitutes acceptance of these terms. For inquiries, complete terms and restaurant location information: visit GoodcentsSubs.com.